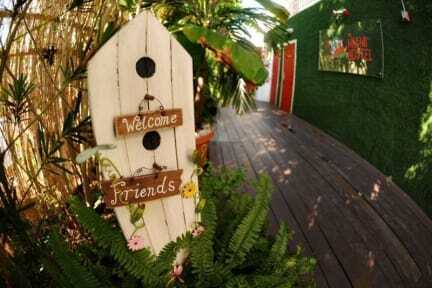 Welcome to Miami Hostel.A tropical style hostel within minutes of famous Ocean Drive, Lincoln Road Mall, the Art Deco District, Espanola Way, and the cinematic South Beach. We are always one step ahead of competition in cleanliness and always top rated for our wonderful atmosphere and guests. We have large communal area with a fully featured professional kitchen, computer area, Free WiFi in rooms, flat screen tvs, dining room and a large outdoor area. The hostel is conveniently located between the organic Wholefoods supermarket, Publix supermarket, MB Liquor store right next door, and fast food outlets including Subway, Burger King, and Dominos Pizza. Store your groceries in our large fridges and save money with our fully equipped kitchen that is open 24 hours. Show us your cooking skills!! Our 14 spacious rooms are available in 6, 8, 10, or 12 bed occupancies (Mixed Dorms & Female Only Dorms). All dorm rooms include lockers, bathroom, shower/bath, hair dryer, power outlets, and central air conditioning and secure key card and Door code access. Rest easy with our 24 hour reception. WE DO NOT HAVE FREE OR PAY PARKING. WE DO NOT PROVIDE OR SERVE BREAKFAST AND ANY MEAL PLANS. Excellent place for the money, you can walk to the beach, bars, restaurants, supermarkets in a few minutes. The place is always clean and its staff is friendly. spacious patio with armchairs, bar and pool table. It is a good place to share and meet new people. In the evening they offer some snacks like pop corn or hot dogs or nachos with cheese to share in a friendly atmosphere. It was definitely a pleasant experience for me. Great hostel. All basic amenities are in order. Nice social area with pool table and bar you can sit at (byob btw). Price is excellent! My first visit staying at the Miami hostel on Alton rd. And it was a splendid place that me and my friend stayed there from March 12-20th. I hope to return again in the future. Absolutely fantastic hostel! Good value for the money and they are non stop cleaning the place. Pool table is a great addition. Only bad thing to say is that it wasn’t as much of a party hostel as we were expecting, but the next again it never said it was. The location is the highlight of the place (there is a Whole Foods a block away), then it is followed by the customer service,the reception guys looked genuinely happy to help me every time I had a question. Yes, you can cook and store your food in the fridge. Yes, it is within walking distance from south beach and yes there is a nice area to play pool, hang out and have drinks until 2 am. My only complaint was the SQUEAKY BEDS.YALL NEED MORE OUTLETS IN THE ROOMS AND READING LAMPS on every bed!! The hostel itself is fine. I strongly recommend, DO NOT bring a car with you. No parking Lot, Street parking is almost non-existent. I worried about my car all night. Terrible experience with my booking at Miami hostel. The front desk never answered their phone. They also blared loud music till 2:00 a.m. When I asked the man working the front desk if he could turn it down he was rude. He told me he could refund me & I could leave. Also, the toilet in my room was clogged & didn’t function for my entire stay. The worst hostel experience I’ve had anywhere in the world.